Twenty-five years ago, HH Pope Shenouda III formed the Coptic Orthodox Diocese of the Southern United States with 11 states. It is the first Diocese to be formed not only in the United States but also outside of Egypt with the exception of Sudan and Jerusalem. Today we thank God for this blessed and historical formation of our beloved Diocese filled with many beloved fathers, servants, and congregants. We pray that the Lord continues flourishing our beloved Diocese with many fruits unifying His children in His name. We ask the Lord to preserve the life of our beloved father, His Holiness Pope Tawadros II, Pope of Alexandria and Patriarch of the See of St. Mark, and the life of our beloved shepherd, His Grace Bishop Youssef for many years and peaceful times. 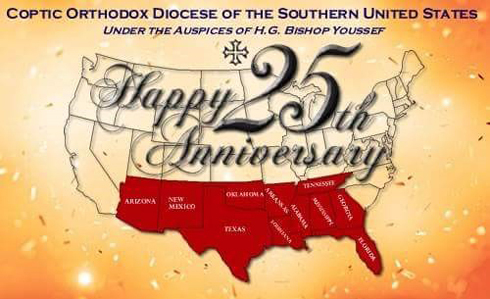 Happy 25th Anniversary for our beloved Diocese!